Whenever I have something weighing on my mind, I find it very helpful to do one of two things: knead (and beat and punch and smack and roll) dough and talk it out with a good friend. On Monday night I got to do both at the same time. I felt better and I got a delicious pizza out of the process. Win. Preheat oven to 500 degrees F. Lightly flour a baking sheet or pizza pan. Roll pizza dough on a floured surface into a 12" circle (or oblong shape or rectangle--whatever you like). Transfer to floured baking sheet/pizza pan. Spread pesto over dough, leaving a 1" border. Top pesto with mozzarella medallions, evenly spaced apart. Bake for 12-15 minutes, or until crust is golden-brown and cheese bubbles. While pizza bakes, dress the arugula with the olive oil, balsamic vinegar, salt and pepper to taste. Cut the cooked pizza into wedges, but leave in the shape of a pizza. Top with the dressed arugula. Serve immediately. 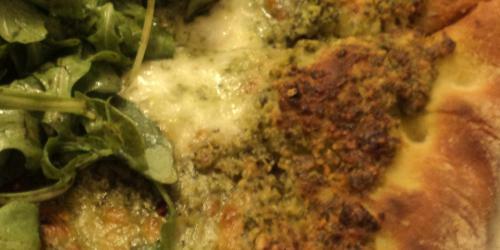 I ate pesto pizza in Ticino, Switzerland, when I was in college, and I still dream about that pizza. I’ve tried to reproduce the recipe many times, but never with great success. Yours is a more up-to-date version, and healthier too.